Beryl is confused about the delivery date of her new table, she thinks she has made a mistake and now needs to accompany her husband Albert at his hospital appointment. Beryl likes to talk (a lot) and listening is made even more difficult by the constant yapping of her dog Bowser. The Black Stuff was founded in 1983 by Sid Black, a Commissioning Manager based in the UK. Sid is talking to his financial adviser about bonds as a method of raising capital. Ted, a manager at an international charity is overwhelmed with interpreting and applying the new competency framework. He simply doesn’t understand how the approach will benefit him or the staff. The fictitious company Catawampus make herbal remedies to soothe feral cats; their products include Mewsic, Cattitude, Clawsome and innerflealings. You are a learning and development consultant who has been called in to help the organisation avoid a catastrophe. Have you ever binged on a boxed set of a serial such as Breaking Bad or The Wire? Now consider a serial on TV where it is scheduled weekly, the plot is subtle, you can empathise with some of the characters and their challenges, each episode ends on a cliff hanger. Everybody at work is speculating about what might happen next you can’t wait for the next instalment. Binge watching deprives us of all of this problem solving time because the answers are just a few seconds away, so no need to think, to talk or speculate. Many training programmes are more like a binge, we force feed learners and yet clever design and timing, and a compelling story can create much healthier states for learners. When we’re engaging in stories, we’re simulating experience. We’re simulating what it’s like to be in the situations that are described in the story. We can all empathise with Beryl, we all know someone just like her, Beryl’s character provides a metaphor for helping call centre employees to explore cognitive empathy – being able to see Beryl’s viewpoint and emotional empathy – being able to feel what Beryl feels. A story, where events unfold one after the other has such a profound impact on our learning because we want to relate it to one of our existing experiences. That’s why metaphors work so well with us. Whilst we are busy searching for a similar experience in our brains, we activate a part called insula, which is linked to emotion, and interpersonal experience, this helps us relate to that same experience of pain, frustration, excitement. There are two key aspects to an effective story it must capture and hold our attention with hooks, twists, surprises, and it must transport us into the characters’ world. Once a story has sustained our attention long enough, we begin to emotionally resonate with story’s characters. 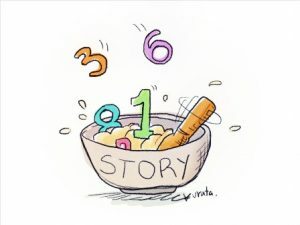 While stories can help us to understand cultures, morals, and behaviours, they are also useful when there is a need to memorise complex information. The easiest way to memorise that information, then to also communicate it, would be to contextualise it by embedding it within a fictional story. This is exactly what we did in the case of The Black Stuff a story based blend for a financial services company based on Sid and his conversations with his financial adviser about method of raising capital. This story was designed to enable learners to understand a range of financial services products through the commercial eye of a business. Stories are emotionally compelling they engage more of the brain, and therefore are better remembered, than simply stating a set of facts. We look forward to engaging you in our next story………………..
Do you suspect that you could get so much more out of your competency based performance management approaches? Perhaps you have managers who are a little wobbly in their application? Would they like to meet Ted? Click here if you too would like to take Ted’s journey to applying competency based approaches to performance management. Do you wish to improve the quality of your learning materials? To increase retention of learning? To build powerful learning experiences that resonate with learners? To be that consultant at The fictitious company Catawampus? Learning by Design is the answer.